I inserted an advertisement in the help wanted section of Mondo Italiano newspaper seeking a part time advertising sales professional. Brian called me up about the position and we agreed to meet at Legends sports bar in Nordeast Minneapolis. He was wearing a hunter green baseball cap the day we meet. We had a few friends in common and get along very well immediately and he was very excited about the opportunity. Brian could barely read and write but he was a genius and a master salesman. He had a great sense of humor as well. When I asked him if he would sell advertising to such and such restaurant he would jokingly reply: If they don't buy I'll go in to the place and flip over all the tables. Seldom did he walk out of a business without a check or cash in hand. He helped me grow the publication from 5000 copies and 8 pages up to 12,000 copies monthly and 12 pages by landing accounts such as Lido's Cafe, Totinos, Broadway Pizza, Brian Pitera Law Firm, Angelo Rulli Real Estate and even an Arab restaurant called El Bustan. Brian loved cultures and could talk for hours about Judaism, the Roman Empire, the Ottoman Empire and just about any culture stemming from the Mediterranean region. We shared the quality of being lovers of Mediterranean culture. I invested in a membership in the MN newspaper association and gave him and myself a press pass. That was probably the year of his life that he was the most proud. We got in everywhere with those press passes. Concerts, art gallery events, nightclubs and once even got let in free at the movie theatre in Mall of America. 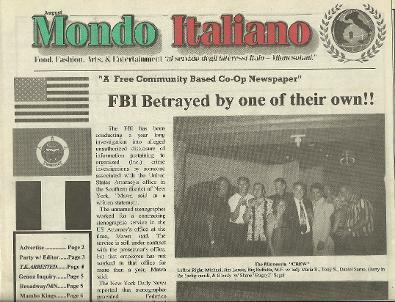 Brian and I both loved to go by aliasas when we represented the newspaper. 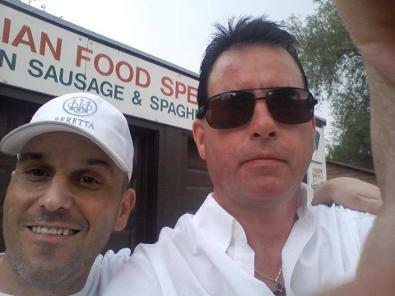 I was Jimmi Santiago and he was Brian Buffetta whose last name came from his Italian ancestry. He was very loyal to his friends and would do anything for you. Brian was too wise for this world and we are saddened to see him go but he will not be forgotten. Everytime I return to Mancini's Char House he will be remembered, everytime I go to Nordeast Mpls he will be remembered and when I drive by the fishing charter boat on Las Olas and A1A in Ft Lauderdale he will be remembered. We joked with the boat owner about the weight of the fish he was holding up. The guy got so offended he chased us off with a garden hose!